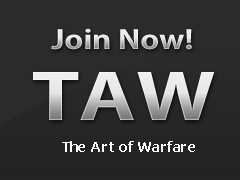 Welcome to TAW's Newsletters wiki, here you will find all of the Newsletters that are available in our community for your viewing pleasure. Back issues of "From the Battlefield"
This page is owned & managed by MMD media staff. add them to the list below, however please bear in mind that there might be some delay. If you feel comfortable adding your newest edition without breaking the rest - go for it! Please contact [MMD] Multimedia Marketing Division Command for any queries.